Today’s guest(s): Fr. Antonio Medeiros and Fr. Emanuele De Nigris, the Rector and Vice-Rector of the Redemptoris Mater Archdiocesan Missionary Seminary in Brookline. 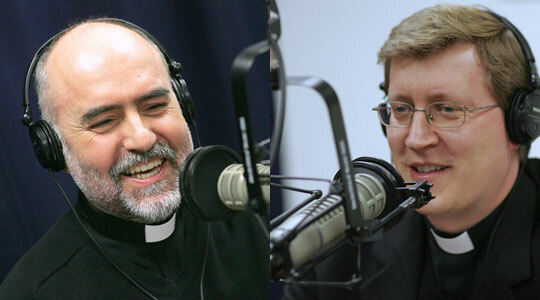 A summary of today’s show: The Redemptoris Mater Archdiocesan Missionary Seminary is the least-known and newest of Boston’s three archdiocesan seminaries, but it is currently forming one-third of the archdiocese’s seminarians. The 18 men come from around the world to become archdiocesan priests with missionary hearts, who will serve in Boston or in the missions at the local ordinary’s discretion. Also, on May 15, the RM Seminary will honor the Pope’s apostolic nuncio to the US at a gala dinner. 1st segment: Cardinal Seán often says that “vocations are everyone’s business.” We need to pray for vocations and to encourage young people to consider where God is calling them. We have three archdiocesan seminaries: St. John Seminary in Brighton and Blessed John XXIII National Seminary in Weston, and then Redemptoris Mater Archdiocesan Missionary Seminary, which has 1/3 of all Boston seminarians. Redemptoris Mater Seminary is both “Archdiocesan” and “Missionary” and one of its goals is to prepare priests for the New Evangelization, both within our Archdiocese and then also in the missions. The Redemptoris Mater Seminary is preparing priests to do just that. Our Archdiocese of Boston has had a tremendous tradition of supporting the missions and the people around the world, sending many priests to the Saint James Society and to serve as chaplains in the Military. The Redemptoris Mater Archdiocesan Missionary Seminary is continuing that tradition and also introducing many new things to the life of our Archdiocese. 2nd segment: Scot welcomed Fr. Medeiros and Fr. De Nigris to the program. Scot said he found all the priests and seminarians at RMSB to have very varied backgrounds. He noted that Fr. Tony was born in the Azores and then moved to Fall River in 1980 with his family when he was 16, not speaking any English at the time. (He now speaks 7 languages.) He came to know a priest who moved him and who inspired Fr. Tony to want to become a priest. He started the path through seminary education in 1982 and entered St. John’s in 1986. He struggled during those years in the seminary to determine that this was indeed the vocation God was calling him to. He left the seminary and spent time in Rome in discernment. He attended World Youth Day in 1989 in Santiago de Compostela in Spain. He heard John Paul II’s call to young men to be holy and to follow God’s call. Fr. Tony talked with his friends in the Neocatechumenal Way, which he had joined by then, who helped him to see his vocation. In 1993 he was ordained for the Diocese of Rome after attending the first Redemptoris Mater Seminary, which had been opened by Pope John Paul II. He was ordained by the Holy Father. Fr. Tony said JP2 did the greatest service to the Church by offering intense personal witness of his life, his spirit, and his courage. Later, Fr. Tony was sent to China where he was to lead a new Redemptoris Mater Seminary in Hong Kong. Fr. Tony said he learned to follow the footsteps of Christ, where Jesus walked before Fr. Tony followed. A lot of the first work involved learning the language and the culture, establishing contacts. He had to learn the Cantonese language only after he arrived. Then, moving to Taiwan, he learned Mandarin. Cardinal Seán asked Fr. Tony to come and found a new Redemptoris Mater Seminary in Boston in 2005. Cardinal Seán learned about the RM seminaries when he was an apostolic visitator to seminaries as appointed by the Vatican. He became a big fan of RMS after meeting the priests and seminarians. Fr. Emanuele was born in Italy near Turin. His parents were part of the Neocatechumenal Way and that’s how he began his journey. When he was young, he used to say that he wanted to be a priest one day, but stopped saying it by the time he was 12 and thought he wanted to have a family. But later, the Neocatehumenal Way helped him discern his priestly vocation as his Christian faith matured. He was able to consider the vocation without fear that it would be something he would not like. He came to know that God wanted his happiness in his true vocation. His mother’s illness after giving birth to Fr. Tony’s twin sisters was also a time of discernment as he considered the meaning of his mother’s suffering. Through considering the questions of the meaning of life, he began, first, to rebel against his upbringing, and then to realize how wrong he was, that God took good from the evil of suffering. Thanks to the support of his community, his catechist, and his parish priest, he stopped resisting God’s will. For him it was World Youth Day 1993 in Denver that was his turning point, when he emerged from his “underground” Christianity to open himself to the possibility of the priesthood. He found the strength to leave his girlfriend and his university studies in law to follow the path God had laid out. He chose the Redemptoris Mater Seminary, in which the seminarians are sent to dioceses not of their own choice, to be ordained for those dioceses. He was to be formed to be a missionary priest to the world. All Redemptoris Mater seminarians are selected by lottery to any of the 87 seminaries in the world and they will be ordained for that diocese. Fr. Emanuele was sent to the first RM seminary in the US in Newark. He didn’t stay in Newark, but was reassigned to Washington, DC, because Cardinal McCarrick, who had been archbishop in Newark, decided he wanted the same RM seminary in DC. So he asked the archbishop of Newark to send 7 men to help found an RM seminary in DC. Fr. Emanuele was assigned to DC, was ordained there, he worked in a parish in Silver Spring, Md., became the cardinal’s secretary, and then worked in a parish in Germantown, Md. He was sent last August to Boston to help form the 18 men at RMS-Boston, who are about a third of the seminarians for Boston. 3rd segment: The 18 men at RMSB come from nine countries in Europe and Latin America. They use English in the formation house to help them learn the language. The name Redemptoris Mater means “Mother of the Redeemer,” referring to the 30 years Jesus lived in formation in his family. It also refers to John Paul II’s 1987 encyclical. The big difference in the formation of the RM seminaries is that the seminarians continue the formation of the Neocatechumenal Way. The Way is a missionary movement to help the lost sheep of the parishes to find their way back to the Shepherd. Most of the seminarians have experienced the missionaries at their own doors, inviting them to come experience adult catechesis at their parishes. The other elements of priestly formation are the same as other seminaries. The RMSB seminarians receive their academic formation primarily at St. John Seminary, but their pastoral, spiritual, and human formation at RMSB. Living in the house with men from all over the world that they did not know before leads them to learn how to live with a person, to reconcile and overcome differences, which brings a richness. They are also assigned to one of the Neocatechumenal Way communities in various parishes throughout the Archdiocese, going there several times a week, including the Eucharist on Saturday nights. It also helps them to become familiar with the Archdiocese which has become their new home. They are welcomed into the homes of Bostonians. The seminarians will be archdiocesan priests, but are open to being sent out for missionary service at the discretion of the local bishop. The men ordained through RMSB are hoping that they will be assigned to work in the missions. Fr. Emanuele said the greatest expectation, of course, is to become a priest, but they are learning that it is possible to be a missionary priest in Boston to go out and evangelize those who don’t come to the Church any more. They also have the openness and desire to live the missionary vocation somewhere other than the Archdiocese as well. This isn’t a sure thing, but they are to be ready to be sent at any time. They should be open to the Lord sending them out. As part of formation, the seminarians have a couple of years of itinerant evangelization experience. They learn to rely on God alone to sustain their lives and vocations. Fr. Tony said it is an essential aspect of formation. They are taken from their schooling for 2-3 years to live with a priest in a parish, working beside the priest. It introduces them to a God attuning them to the rhythm and the mission that belongs to God. During this assignment, they live in poverty and learn to lean daily on the providence of God. The seminarians are not allowed any money, and they always go two by two, as Jesus sent his disciples two by two to announce the kingdom, without any security. They have three men on this assignment right now: the Holy Land, Washington DC, and the Carolinas. At this point these seminarians are no longer in parish work, but working with Neocatechumenal Way communities as well as visiting with pastors proposing the creation of these communities in their parishes. One seminarian in his 3rd year of seminary right now had previously spent 3 years in itinerant ministry in India, Pakistan, Sri Lanka, and Nepal. The history of the Church in Boston has immigrant roots. The experience of being foreigners here helps them to better understand the experience of the families of the people they will serve. The seminary is currently in a rectory of a former parish in Brookline, which was originally built for 7 or 8 people to live in. Fr. Emanuele called the experience of living in such close quarters very “formative”. The amazing thing is that no complains about their living space. While there may be disagreements, there is also reconciliation. But because they hope to welcome even more seminarians, they hope to one day find a bigger space or even build a new seminary to hold more seminarians and give them a life and space more conducive to their formation and spiritual growth. He said it’s very difficult to find a place of silence in the current seminary. Fr. Tony said when RM seminaries are built, they incorporate the fruit of the Second Vatican Council, and find it very important to respect the importance of beauty, as an element especially in which the environment affects a formative dimension on a person. The place itself tells him that God loves him. Paintings and artwork are very important as a dimension of objective beauty. 4th segment: On May 15, the 2nd annual gala dinner to benefit RMSB will be held. It was hosted at the Pastoral Center last year, one of the biggest events as yet in the building. They honored John and Margarete McNeice for their support of the seminary and Cardinal Seán for his support of the New Evangelization. This year, the dinner will be held at Lantana’s in Randolph. They will be honoring Archbishop Pietro Sambi, the apostolic nuncio to the United States, and local businessman Jack Shaughnessy. Fr. Tony said Archbishop Sambi is coming to show his love and respect for Cardinal Seán and the people of Boston. He is in a position of great importance for the Church in the US because of his role in helping the selection of bishops. It is an honor for the seminary and for Boston. This is his first speaking engagement in Boston since being appointed to the US in 2005. Scot said because of his responsibilities in the US, he is worth hearing live and he is a wonderful speaker. Fr. Emanuele said the apostolic nuncio has a first responsibility as ambassador of the Pope to the United States in a diplomatic role. But he also has a great role in the Church in the United States as a point of reference for the bishops of the US, being a point of contact for them. And he has a responsibility to gather the names of potential candidates for bishops to forward to Rome for the eventual selection by the Holy Father. As one of the largest bishops’ conferences in the world, it is a very large responsibility. Fr. Tony said he hopes that many people can come to show their support for the seminary and for the priests of the archdiocese through both the fundraiser aspect, but also to allow many of the priests to hear Archbishop Sambi. Boston can show the archbishop that the Church in Boston is one and whole. It is open to families, left to the judgment of parents.